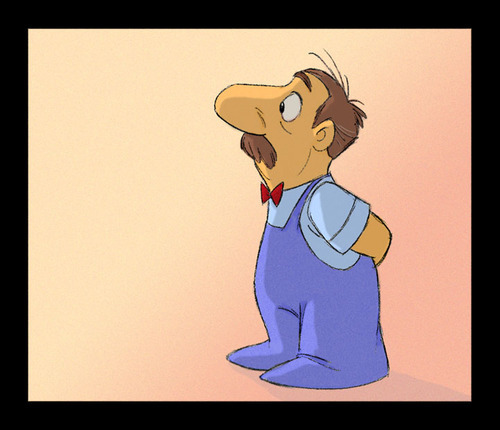 Doodle with Wacom tablet using TVP Animation 9.5 . I guess that's some sort of "bear". 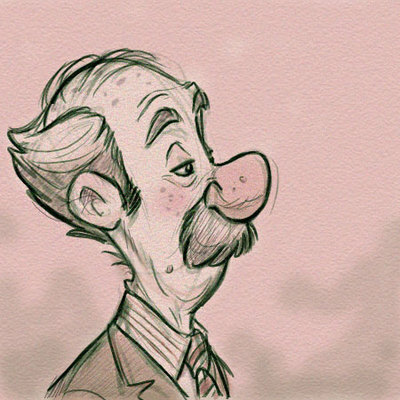 Mainly just playing with shapes, and trying to lay down a spontaneous "ink brush" line without erasing or noodling it. Trying to get better with the tablet. Started to add in some color washes and got carried away with the rim lighting effect, probably should have just stopped with the sketch and moved on (so much for not "noodling" it) . I'm throwing these up (apt term) not so much because I think they're that great , but to goad myself into trying to get better with the Wacom Intuos tablet. There's a certain lack of control I'm still not happy with. It's me , not the tool, because I've seen people do great work with these things. 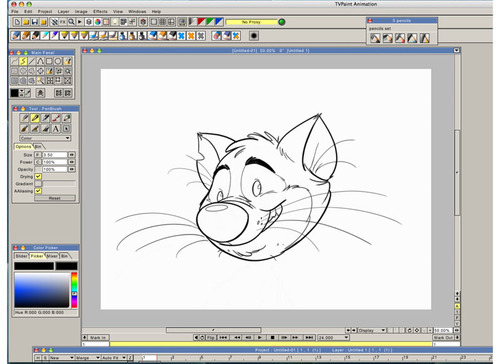 Couldn't resist and cheated this one using the Warp Tool in TVPaint 9.5 to make the lower part of his face heavier, and the nose larger. Well, so much for spontaneity (cheat, cheat, cheat). More doodles ... Still struggling to get back into drawing with Wacom Intuos 3 tablet. 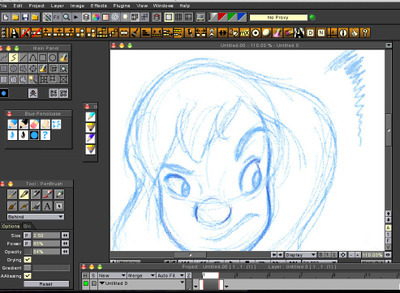 To me this is hard compared to using the Cintiq..
Noodling around with TVP Animation when I should be doing something else. 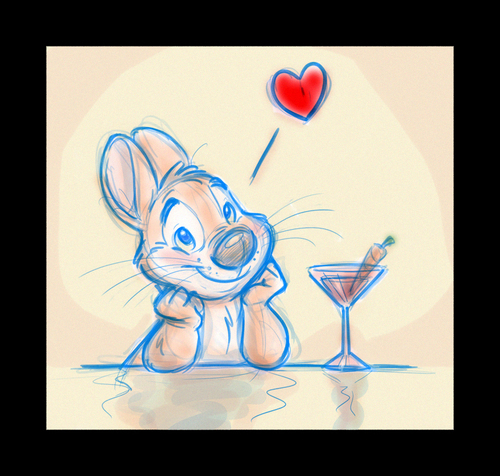 Haven't posted anything on this blog in so long I just thought I'd toss it up here. 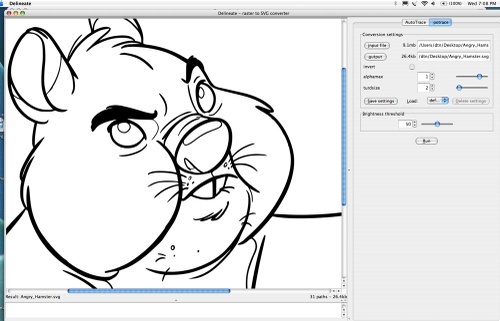 Drawn and colored in TVP Animation Pro 9.0 . "Michael Riley, Shine’s creative director, composed images of traditional Chinese landscapes, calligraphy and 2D character animation set in a 3D landscape all choreographed to the classic Carl Douglas song “Kung Fu Fighting”; remixed by Cee-Lo Green, accompanied by Jack Black. 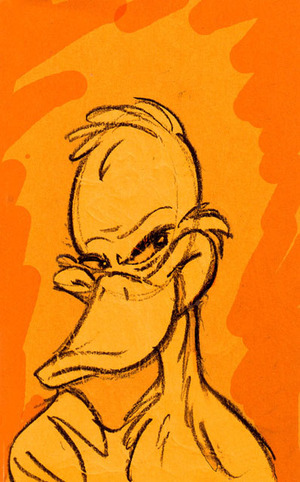 Riley’s concept included reprising the film’s main characters in original cell animations by finding them hidden in a gigantic Chinese calligraphy character. 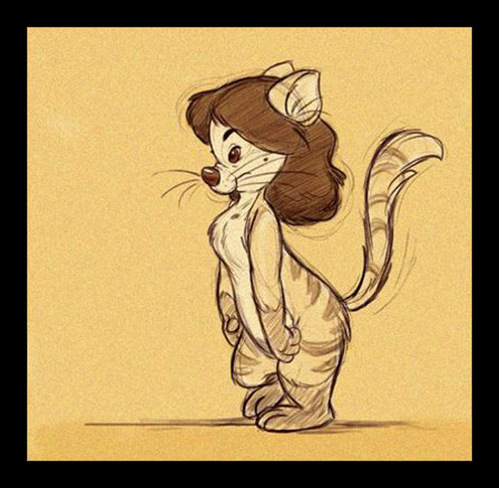 This mix of disciplines required a tremendous collaboration between Shine, James Baxter Animation and the DreamWorks Animation team of animators, production designers and directors. " The movie Kung Fu Panda opens with a brilliant 2D animated sequence (animated by James Baxter Studio) and is bookended by the end credit sequence (animated by DWA) which reprises the look of the opening 2D dream sequence. Be sure to click the link above to view the end credit sequence as a high-quality Quicktime. Bonus ! 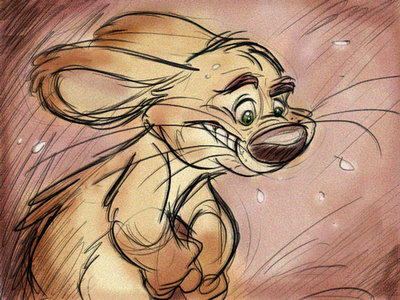 Now MSN Movies has posted the complete Opening Dream Sequence animated by James Baxter Studios. Another digital drawing messing around with TVPaint . I promise I'm working up to something more substantial, but from time to time I just have these little sketches that turn out looking pretty nice (to me) and I have no where else to post them, so they turn up here. Haven't put up one of these in a while . 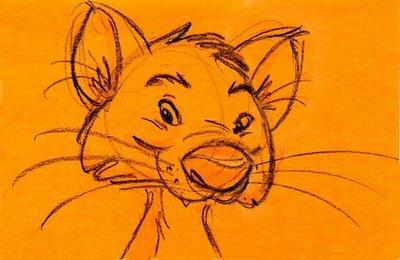 Prismacolor, marker, Col-Erase pencil and Liquid Paper™ on Post-IT™ note. 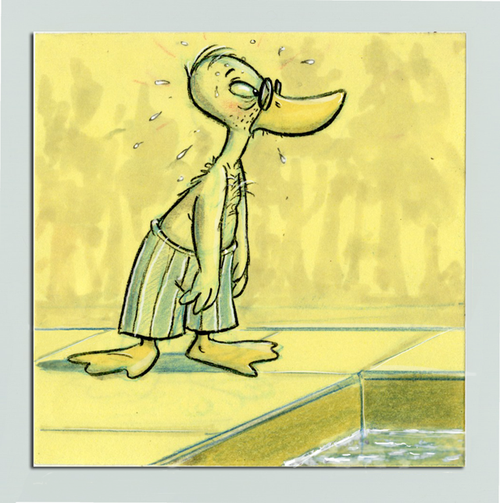 Here is a very interesting and useful piece from the Fleischer Studio. 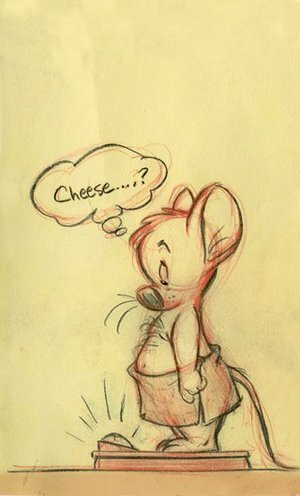 I think I got this from Shane Gline's Cartoon Retro site . 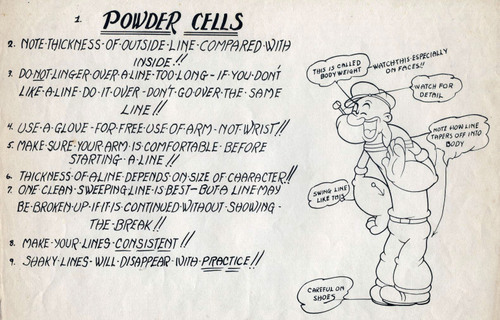 Other than the references to "powdering your cells" (change that to "clean your tablet") this remains a very good guide to dynamic inking, especially as it applies to "inking" on the Intous or Cintiq tablet. The best Fleischer cartoons always had outstanding inking , with lots of thick and thin line work for emphasis and texture . 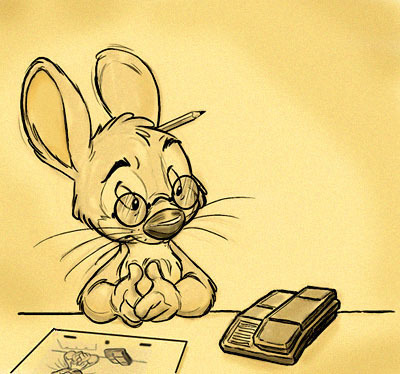 When I see that work and the great inking in the Disney features I'm just in awe of the artists who were able to produce that level of quality. (If you've ever tried inking on a cel with brush or quill pen you know what I mean) The new Popeye DVD is coming out soon. I can hardly wait ! 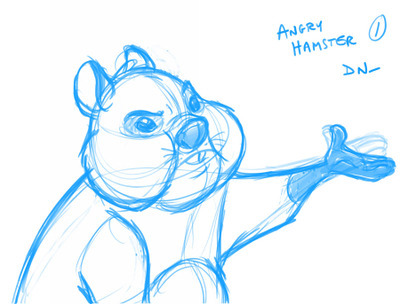 I had hamster's on my mind today because I have a freelance job designing a hamster (not this one) for an animated show and when I was on break I sketched this one for fun, decided to clean it up , so here's another demo of favorite animation/drawing app, TVPaint. I've also been playing around with a freeware app called DELINEATE , which auto-traces bitmap images to vector (SVG) which can them be opened up in Illustrator for further work as an Illustrator file (and thence imported to Flash). 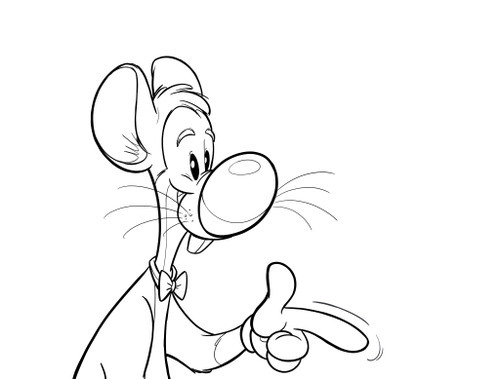 I'm having pretty good results from DELINEATE as shown in the next two images, showing the drawing above (from TVPaint) vectorized by DELINEATE and then opened in Illustrator. 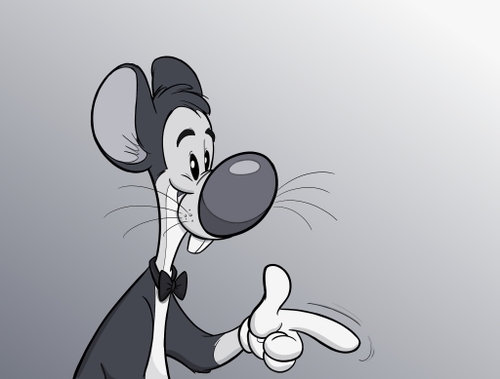 Here's a stab at coloring it , done with TVPaint . 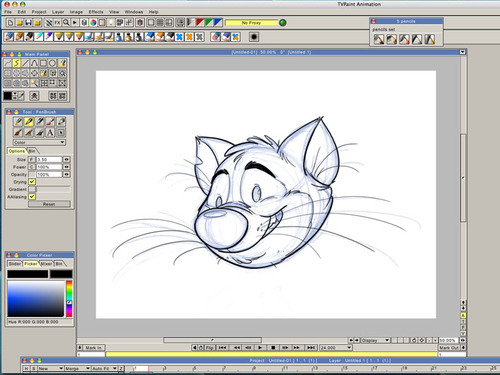 Someone asked about how to get "smooth" clean up lines using an application like TVPaint . 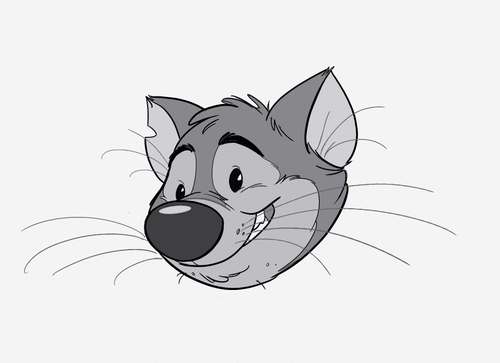 I answered with a little tutorial made from a quick rough sketch of a cartoony cat's head . 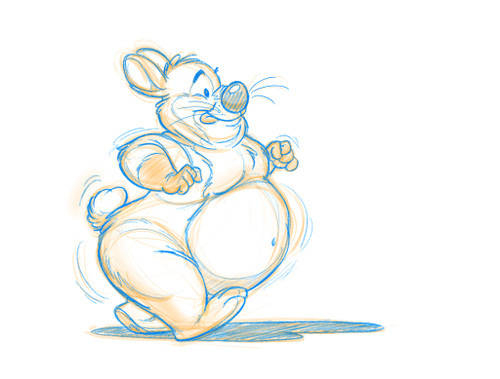 This was done on the Cintiq tablet . I usually start with a "rough" blue pencil from the Sketch Panel , then on a new layer I ink the clean up lines in black . 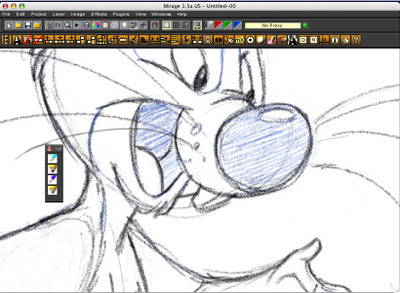 I make sure to take advantage of the rotating "virtual animation disc" in TVPaint to rotate the drawing to the best angle for laying down the clean up lines smoothly and I use the zoom-in control to get closer in on the part of the drawing I am working on. (see the second image) . Then drop out the blue line to leave just the clean black lines. You then have the option of coloring some of the lines a different color from black if you want to by using the Add function in the pen tool . Then add fill color. I've done this one in black & white because it felt sort of like a 30's character with the dot eyes and the pie-cut highlights in the eyes . Not the greatest drawing in the world , but it gives you the idea of what can be accomplished in terms of "smooth" line quality . 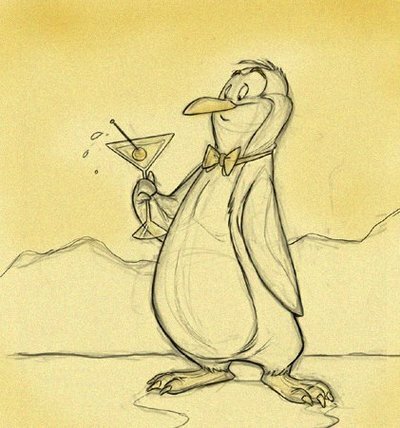 One of my favorite bands is Pink Martini. They've been around for a while, but haven't put out too many CD albums . Their two CD's "Sympathique" and "Hang On Little Tomato" are soon to be joined by a new , long awaited CD , "Hey, Eugene". Check 'em out . "Somewhere between a 1930s Cuban dance orchestra, a classical chamber music ensemble, a Brasilian marching street band and Japanese film noir is the 12-piece Pink Martini." Feeling relaxed, contented, and on top of things again (which is unusual for me lately, but I'm finding my center again). 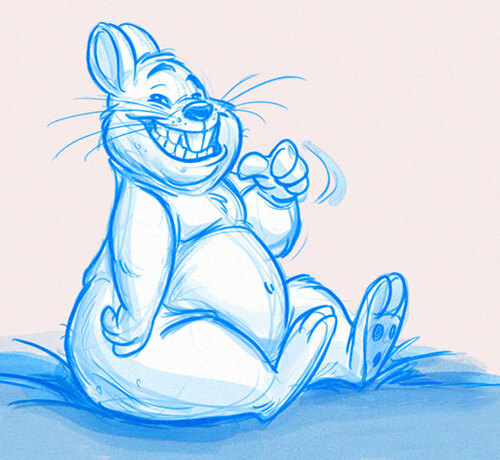 so, here 'tis : a relaxed and contented bunny drawing. 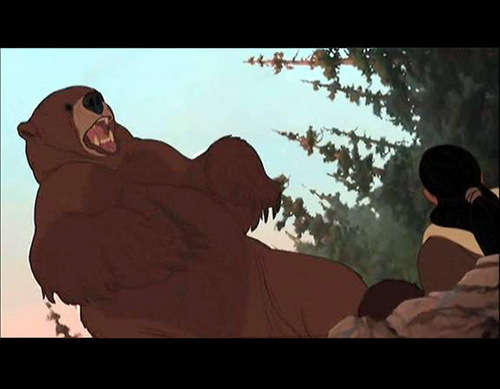 "Give me a BIG Bear growl... scare me !" 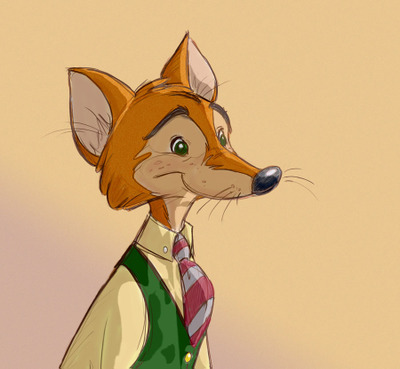 Today I had the pleasure of hearing from Rune Bennicke, who's great model sheet of Little Feather (from the never completed "My People's" ) I posted a few weeks ago. 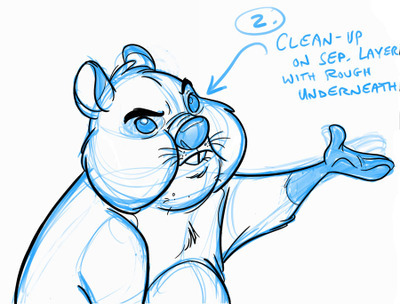 Rune included a couple of copies of clean up model sheets I did for one of the characters he animated in "Brother Bear" , Koda's Mom , and suggested I post them here. 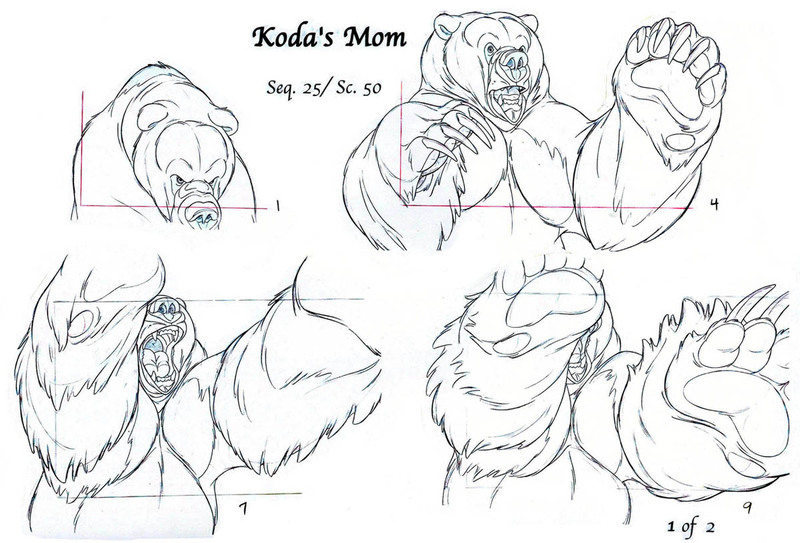 These sheets are my clean up drawings , attempting to retain the powerful, primal quality in Rune's beautiful rough animation of Koda's Mom. 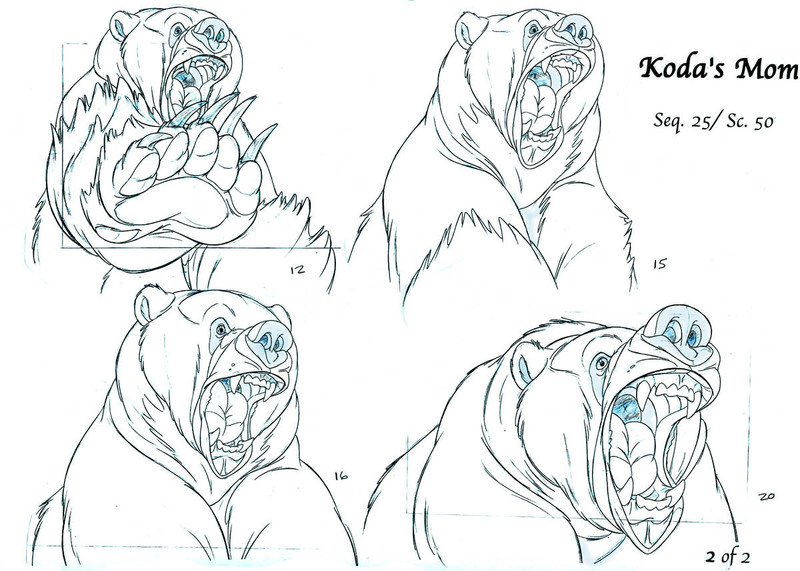 The idea was to not treat it as simply a "clean up" line in the customary modern sense of putting down a pretty, closed-off, no gaps line ; rather we tried to take an organic , rougher line approach to keep the big mother bear looking like a true force of nature as in the rough animation. It was a great assignment and I'm thankful to Rune for trusting me with this character , and also his more comical , anthropomorphic bear character, Tug . 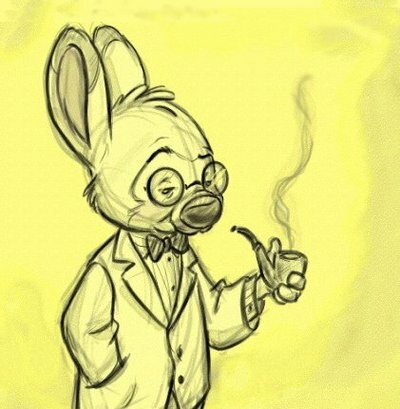 Copyright © Walt Disney Co.
A face from the past . 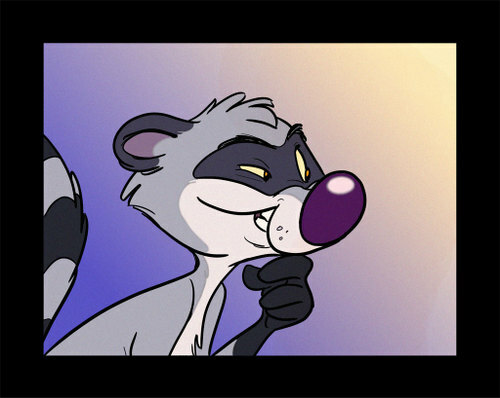 This drawing was a request from someone who wanted a drawing of "Meeko" , the raccoon from Disney's Pocahontas, which I worked on as the clean up lead (working with Nik Ranieri who was the supervising animator on Meeko) . 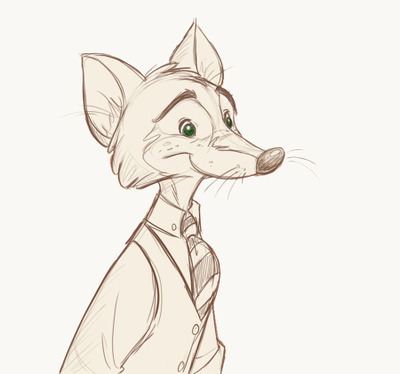 Like almost all of the other drawings I've posted lately ,this was drawn on the Cintiq tablet. 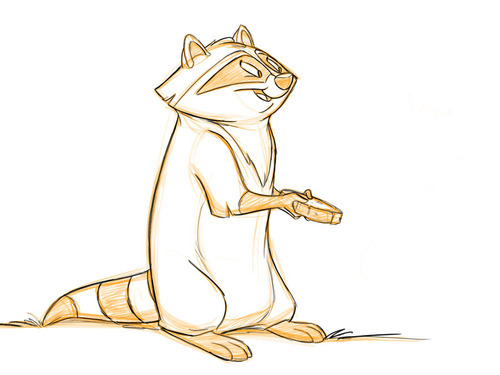 "Meeko" Copyright © Walt Disney Co. 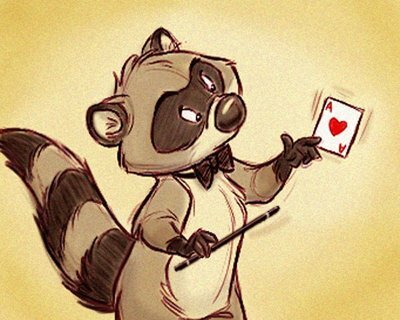 Crafty looking raccoon. What's he up to ? After a brief respite, Self-Portrait week continues here on You're A Gazelle. 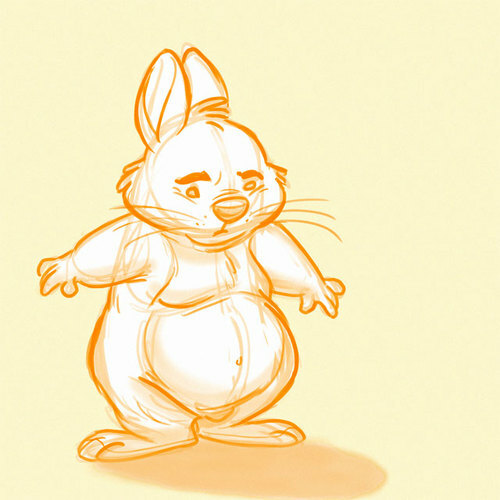 Lay off that carrot cake Big Bunny Boy ! (actually, to be totally honest, I haven't worked out this much in real life ,but other than that the resemblance in profile is remarkable) . 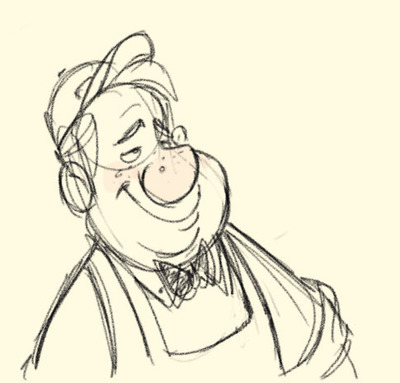 A quick study for a character design. 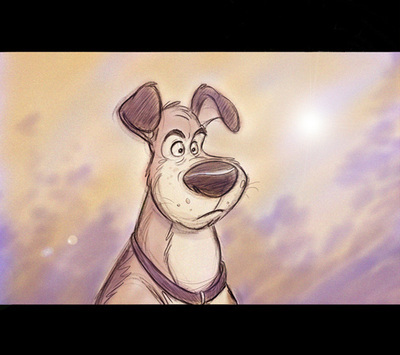 Drawn in Mirage on the Cintiq, colored in Photoshop. This is another one where the digital color frustrates me ... it looks different from browser to browser , and quite a bit different depending on the monitor. It's frustrating how many variables there are . 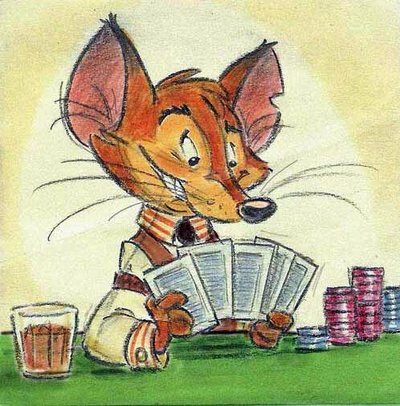 And these are just simple little cartoons with color washes . 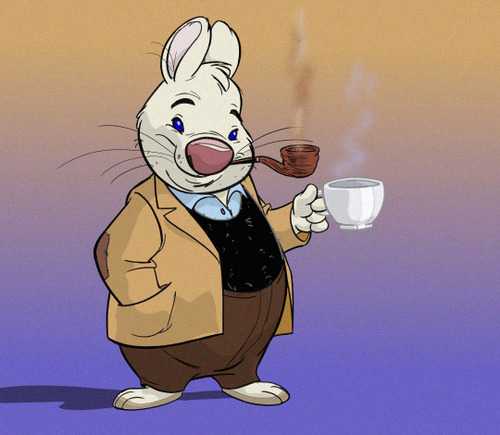 I think how frustrating it must be for people doing full-scale illustrations, trying to get their colors to remain true when viewed in a web browser. This is frustrating. 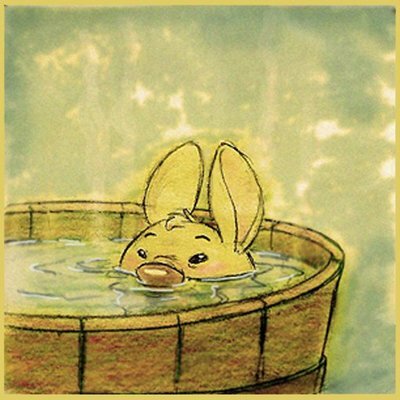 The original of this has intense, sunny colors on the light areas and deep color in the shadows , but viewed in Firefox the color is greyed down. I can't figure out why . Looks fine in Safari. 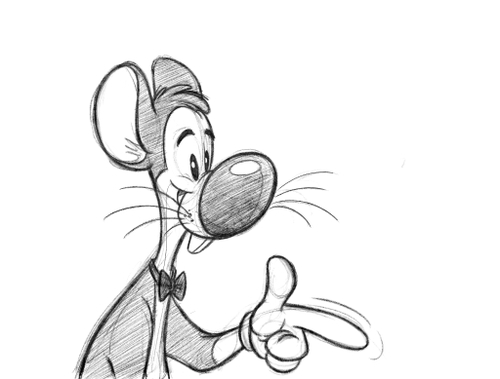 sketched on the Cintiq tablet. Yes, I confess : Today I used the Lens Flare filter in Photoshop. Eddie Pittman and Steven Geer can now throw things at me for my gaucherie and amateurish ways. 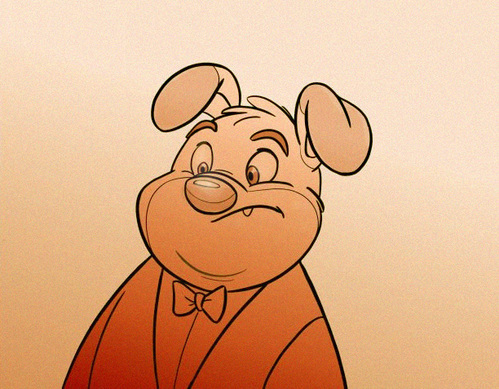 Just messin' around this afternoon , coloring some misc. sketches. This one's not very good , but I've been down on myself for not posting any drawings in a long time , so this is now my motivation to post something better , really soon ! What's on my computer ? I got one of those emailed quiz/survey things from a friend and one of the questions was : "What's on your desktop right now ?" 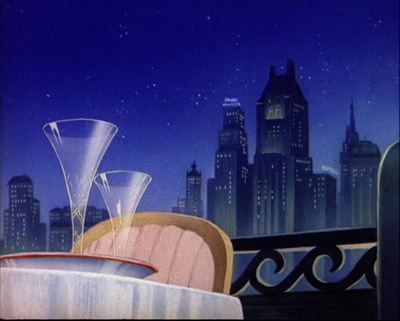 An absolutely gorgeous image from the MGM cartoon "Mouse in Manhattan" a cartoon which spotlights Jerry the mouse , of the team "Tom & Jerry" , wherein Jerry essentially takes a role that would be played by Gene Kelly if it were a live-action MGM film. Very different from the usual Tom & Jerry formula. 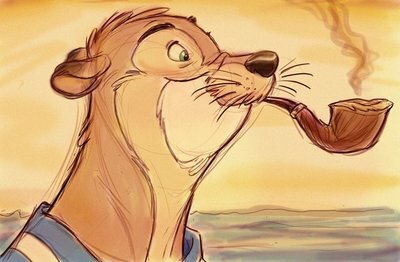 I forget where I found this image ; on someone else's blog , there were several MGM cartoon layouts and backgrounds shown . Here's what else is on my computer right now : I'm having a ball learning to work with a program called Mirage, from Bauhaus Software. 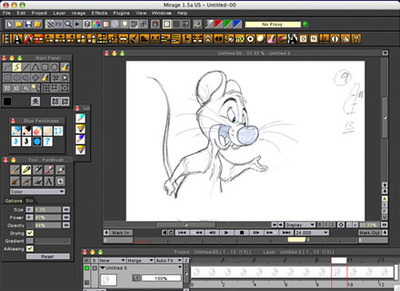 Mirage is a 2-D animation program that allows the animator to draw directly into the program, frame by frame, more or less replicating the traditional hand-drawn animation experience in a digital environment. The drawing tools are some of the best I've used. They can be customized to feel something like your favorite pencil or pen. It's not exactly the same as drawing on paper, but it's pretty darn close and not at all difficult to get used to. 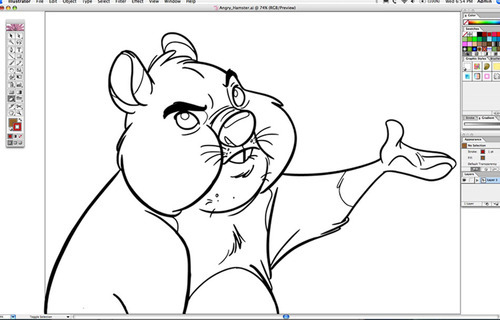 I love that it allows me to draw naturally and not feel like my line is getting "digitized" or changed by the program. 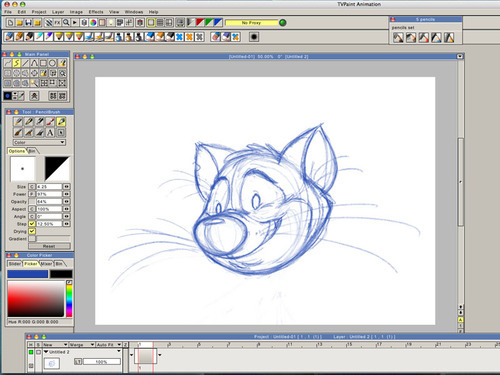 You can animate in full screen mode as shown in the first image, with ability to zoom in and out on the drawing (shown zoomed in here); you can access the toolbars when needed by a simple keystroke to toggle the toolbars on and off. (see next image showing the expanded toolbars) . 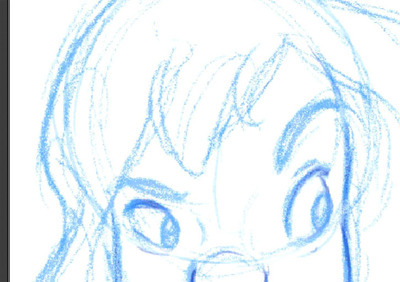 I don't know how well the texture shows up in the posted images, but look at this close-up screen grab showing the "light blue prismacolor" pencil used for roughing-in drawings. Does this look like a computer line to you ? The above images were all drawn at home , using my regular old Wacom Intous 2 tablet,but let me tell you, Mirage really takes off when used with a Wacom Cintiq tablet. 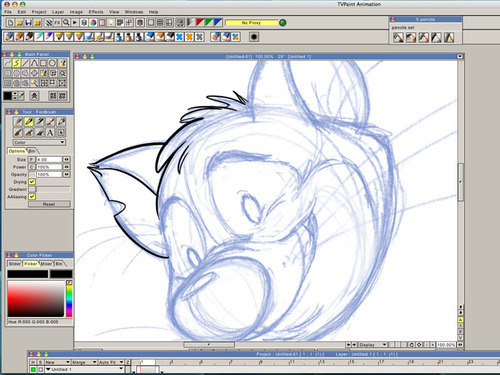 I have a Cintiq at work and using it has totally sold me on wanting to buy one for my own use at home . Rusty is blogging the making of his film and he's active on the Mirage user forum on the Bauhaus Software site. He's making his film entirely with Mirage, animating on a tablet PC (the "Nomad" PC) on the train as he commutes to and from work ! I was leaning towards getting the Nomad tablet PC because of the portability (c'mon Apple : get us a tablet Macintosh !) 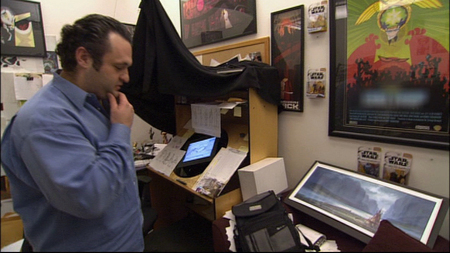 , but I'm going to go with the Cintiq because of the larger work space. 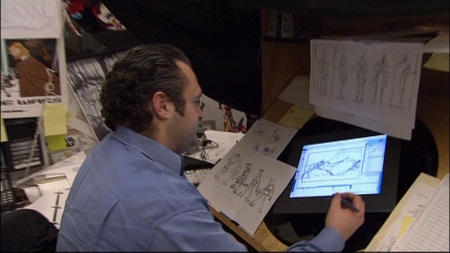 This is Genndy Tartakovsky, the creator of "Dexter's Lab", "Samurai Jack", and the director of the Star Wars cartoon series "Clone Wars", doing layout/character posing for Clone Wars using a Cintiq mounted on a traditional animation disk . This looks like a first generation Cintiq (one of the 15" models) and with the newest version of Cintiq (21") it is not necessary to mount it like this on an animation disk, because the Cintiq turns 180º on the special stand which comes with it. However, I still think this looks cool and if I get a Cintiq I'd like to figure out a way to retro-fit it into my animation table , so the rotation unit is mounted inside the desk, with the Cintiq screen rotating flush with the top surface of the animation table. Wow, I just realized I haven't posted anything here for over a month ! It's been just that busy at work. Things are starting to slow down , so maybe I'll have more time to post some stuff . Just something to post so anyone who's still looking in here knows I'm still around . 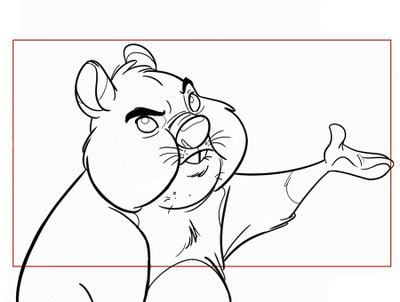 One thing I've been trying to do lately is get back into rough animation after years of doing very tight, very detailed feature -animation style clean up drawings . I'm trying to loosen up and think : "expression" , "movement" , "inner forces" , etc. 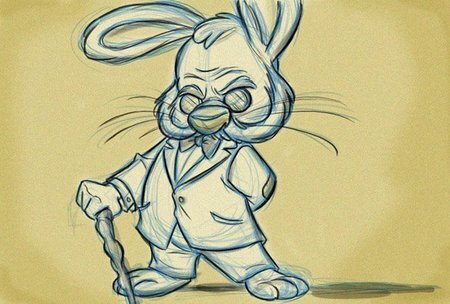 and not get so wrapped up in doing a pretty drawing, with a slick clean up line, even apart from animation tests, in my character designs and misc. sketches. (there's always time to clean it up pretty later on). Let me tell you: it's hard breaking those habits that one acquires as a clean up artist . 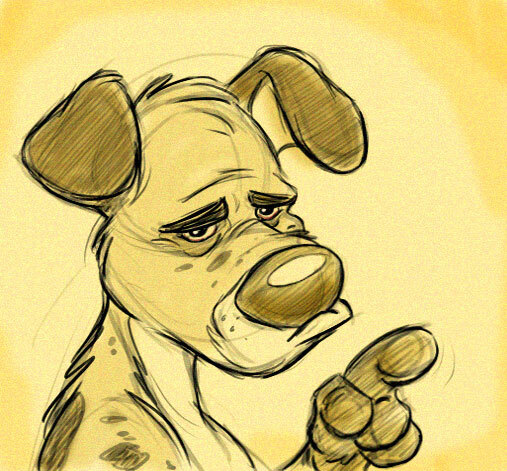 The little self-censor comes on in my head and says: "not good enough" , "not tied-down enough" , "not original enough" , but then I remember why I started this thing : to post my silly little doodles just for the fun of it . No pressure to perform, no pressure to do a "perfect" drawing . So, anyway, this one captured some of the intensity of expression that I was going for. I sort of liked how it turned out (even though I noodled the color washes too much) Hope you do , too , if you're reading this blog. Work has been intensely busy lately ; the project I'm on is racing towards a deadline , so not too much of my own stuff to post , not even "phone doodles" . Anyway, I did come across a great new resource via director Tim Hodge's excellent blog , a book called "In Character: Actors Acting"
watching your handicapped daughter receive her high-school diploma." 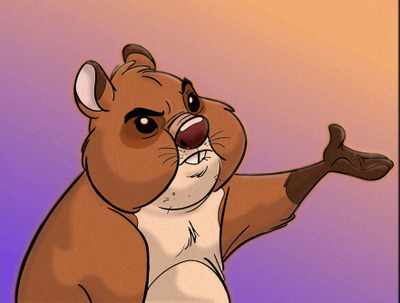 "You talkin' to me, bub ? " "What !? This isn't your card ?" I think his name is Børge. I wish I had one at present."